MANILA, Philippines - The official results, list of passers, top examinees and other important announcements for March 2018 Civil Service Exam - Pen and Paper Test (CSE-PPT) both for professional and subprofessional levels are released by the Civil Service Commission (CSC) within sixty (60) days after the eligibility examinations. 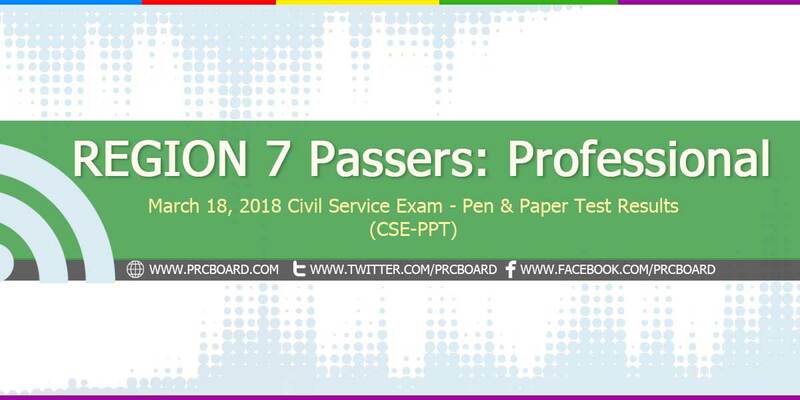 Below is the complete list of passers for March 2018 CSE-PPT Professional Level in Region 7 (Central Visayas). Just wanna ask, of when you will post the result of the professional cs? kailan kaya ang result sa exam?Nakakaba & excited.. kahit 80% lang, Lord.. ok na sa kin.... God Bless us all.. think positive..
Have faith in Him...we will pass the exam guys. God bless us Guys and Congrats in advance! Sana kahit 80% lang. Lord, please. God bless all! Let's be positive! :) Papasa tayo lahat. We will pass the exam because we Trust God and ourselves. pasado lng unta....LORD thy will be done, Amen! pwede bang makita yong score namin, d ko ma view sa (Verification of rating OCSERGS) para malaman namin kong anong subject na mahina kami,sa English ba or Math..
Ikaw lang ang paglaom namu,Ginoong Hesus..